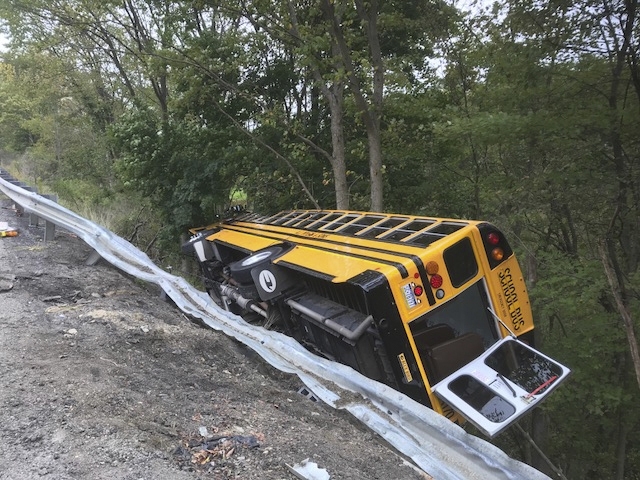 MARS, Pa. (AP) — Officials say some minor injuries were reported after a school bus carrying children ran over an embankment in a construction zone in western Pennsylvania and landed on its side. Emergency dispatchers in Butler County say the crash on Route 228 in Adams Township occurred at about 2:40 p.m. Monday. The Mars Area School District says some minor injuries were reported. The district says it is contacting parents of all students who were on the bus. WPXI reports that at least four patients are being treated. The station says at 41 students were on the bus at the time of the accident. A spokeswoman for Pennsylvania Department of Transportation’s District 10 told the Tribune-Review that the bus struck a piece of equipment in the median of the constriction zone.